The secreted morphogen Wingless promotes Drosophila wing growth by fueling a wave front of Fat-Dachsous signaling that recruits new cells into the wing primordium. During development, the Drosophila wing primordium undergoes a dramatic increase in cell number and mass under the control of the long-range morphogens Wingless (Wg, a Wnt) and Decapentaplegic (Dpp, a BMP). This process depends in part on the capacity of wing cells to recruit neighboring, non-wing cells into the wing primordium. Wing cells are defined by activity of the selector gene vestigial (vg) and recruitment entails the production of a vg-dependent “feed-forward signal” that acts together with morphogen to induce vg expression in neighboring non-wing cells. Here, we identify the protocadherins Fat (Ft) and Dachsous (Ds), the Warts-Hippo tumor suppressor pathway, and the transcriptional co-activator Yorkie (Yki, a YES associated protein, or YAP) as components of the feed-forward signaling mechanism, and we show how this mechanism promotes wing growth in response to Wg. We find that vg generates the feed-forward signal by creating a steep differential in Ft-Ds signaling between wing and non-wing cells. This differential down-regulates Warts-Hippo pathway activity in non-wing cells, leading to a burst of Yki activity and the induction of vg in response to Wg. We posit that Wg propels wing growth at least in part by fueling a wave front of Ft-Ds signaling that propagates vg expression from one cell to the next. Under normal conditions, animals and their various body parts grow until they achieve a genetically predetermined size and shape—a process governed by secreted organizer proteins called morphogens. How morphogens control growth remains unknown. In Drosophila, wings develop at the larval stage from wing primordia. Recently, we discovered that the morphogen Wingless promotes growth of the Drosophila wing by inducing the recruitment of neighboring cells into the wing primordium. Wing cells are defined by the expression of the “selector” gene vestigial. Recruitment depends on the capacity of wing cells to send a short-range, feed-forward signal that allows Wingless to activate vestigial in adjacent non-wing cells. Here, we identify the molecular components and circuitry of the recruitment process. We define the protocadherins Fat and Dachsous as a bidirectional ligand-receptor system that is controlled by vestigial to generate the feed-forward signal. Further, we show that the signal is transduced by the conserved Warts-Hippo tumor suppressor pathway via activation of its transcriptional effector Yorkie. Finally, we propose that Wingless propels wing growth by fueling a wave front of Fat-Dachsous signaling and Yorkie activity that propagates vestigial expression from one cell to the next. Mosaic analysis with a repressible cell marker for studies of gene function in neuronal morphogenesis. We describe a genetic mosaic system in Drosophila, in which a dominant repressor of a cell marker is placed in trans to a mutant gene of interest. Mitotic recombination events between homologous chromosomes generate homozygous mutant cells, which are exclusively labeled due to loss of the repressor. Using this system, we are able to visualize axonal projections and dendritic elaboration in large neuroblast clones and single neuron clones with a membrane-targeted GFP marker. This new method allows for the study of gene functions in neuroblast proliferation, axon guidance, and dendritic elaboration in the complex central nervous system. As an example, we show that the short stop gene is required in mushroom body neurons for the extension and guidance of their axons. The Hippo signaling pathway coordinately regulates cell proliferation and apoptosis by inactivating Yorkie, the Drosophila Homolog of YAP. Coordination between cell proliferation and cell death is essential to maintain homeostasis in multicellular organisms. In Drosophila, these two processes are regulated by a pathway involving the Ste20-like kinase Hippo (Hpo) and the NDR family kinase Warts (Wts; also called Lats). Hpo phosphorylates and activates Wts, which in turn, through unknown mechanisms, negatively regulates the transcription of cell-cycle and cell-death regulators such as cycE and diap1. Here we identify Yorkie (Yki), the Drosophila ortholog of the mammalian transcriptional coactivator yes-associated protein (YAP), as a missing link between Wts and transcriptional regulation. Yki is required for normal tissue growth and diap1 transcription and is phosphorylated and inactivated by Wts. Overexpression of yki phenocopies loss-of-function mutations of hpo or wts, including elevated transcription of cycE and diap1, increased proliferation, defective apoptosis, and tissue overgrowth. Thus, Yki is a critical target of the Wts/Lats protein kinase and a potential oncogene. The author(s) have made the following declarations about their contributions: Conceived and designed the experiments: MZ GS. Performed the experiments: MZ. Analyzed the data: MZ GS. Wrote the paper: MZ GS. Copyright statement: Zecca, Struhl. This is an open-access article distributed under the terms of the Creative Commons Attribution License, which permits unrestricted use, distribution, and reproduction in any medium, provided the original author and source are credited. Loss of histone deacetylase HDAC1 induces cell death in Drosophila epithelial cells through JNK and Hippo signaling. 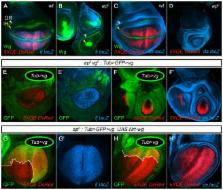 Action of fat, four-jointed, dachsous and dachs in distal-to-proximal wing signaling.